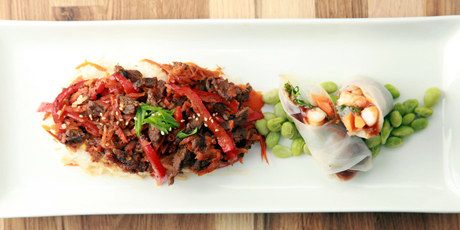 Succulent ginger beef paired with gourmet salad rolls. This dish is irresistable! 1. Slice the beef into thin strips and fry in a hot pan with olive oil. 2. Add carrots, peppers and onions. Add garlic and ginger. Fry until beef is cooked and carrots are soft, about 5 minutes. 3. Mix together soy sauce, rice vinegar, sesame oil, sugar, sweet chili sauce and chili paste. Add mixture to pan and simmer for 5 minutes more. 4. Serve with rice, salad rolls and edamame beans. 1. Mix hoisin sauce, peanut butter, chili paste and water together; add enough water to bring the mixture to a sauce consistency. 2. Soak the rice paper in a bowl of warm water for a few seconds, until it is easy to work with. Gently pat it dry with a towel. 3. Lay it flat and spread a thin layer of peanut sauce in a line down the middle. Layer the other ingredients on top. 4. Carefully place the rice paper over the ingredients in the middle, tucking it tightly over them creating a tube. Fold in the sides, then continue to roll until it is in the shape of a cylinder.